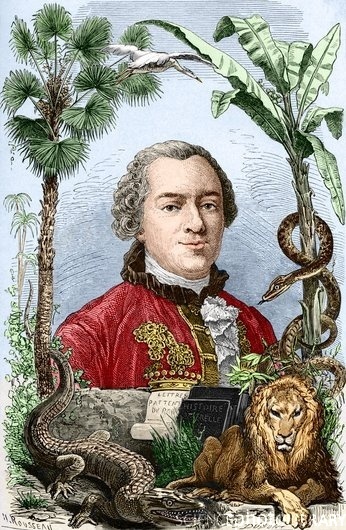 Georges Louis Leclerc, Comte de Buffon, keeper of the French botanical gardens, was known for his theory of degeneracy. He also thought that the Earth was formed by the collision of a large body with the Sun and that it might be up to 75000 years old, rather than the 6000 year limit set by the Bible. Considering that Buffon in his day had a reputation akin to that of Charles Darwin in a later era, these were devastating charges. Among educated Europeans, America essentially had a reputation as a degenerated land full of barbarous and debased people and animals. These notions filtered down to the man on the street as well: Hessian mercenaries who fought with the British in the American Revolution wrote home of their surprise to find their opponents to be white men not so different from themselves. Literary critics even blamed America’s climate for the continent’s alleged failure to produce a decent artist or writer. In what has been called the most important American book written before 1800, America’s leading intellectual — Thomas Jefferson — took on Buffon and the European scientific establishment. First published in France in 1785, Notes on the State of Virginia would be the only book Jefferson ever wrote. He requested that one of the first copies off the press be delivered personally to Buffon. Jefferson the surveyor overlooks the north grounds of the University of Virginia campus. The first section of Notes is usually omitted from modern reprints, but Jefferson considered it to be the heart of his argument. Side by side in table after table, Jefferson compared the animals of the Old World and the New World by weight. In almost every instance the American animal was larger, in many cases astoundingly so. The American cow weighed in at 2500 pounds vs. 763 for a European heifer. The bear tipped the scales at 410 pounds vs. 153 for a European bear. And so on. Jefferson even estimated the weight of the extinct prehistoric mammoths being uncovered in the United States to counter Buffon’s jibe about the New World’s lack of elephants. 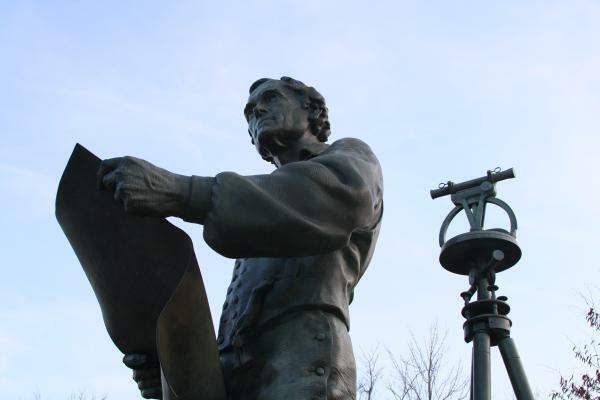 Among those who helped Jefferson gather this data on American animals were Doctor Thomas Walker, explorer of the Cumberland Gap and relative of Meriwether Lewis, and George Rogers Clark, conqueror of the Old Northwest and brother of William Clark. 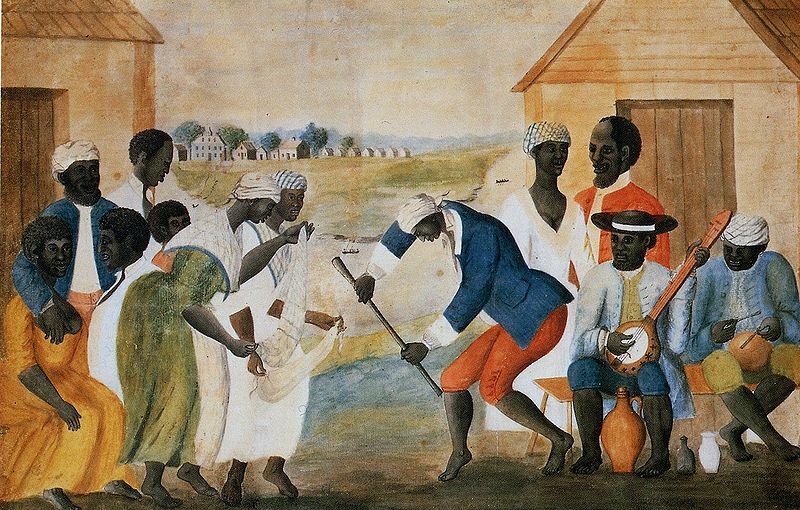 This folk art piece was created between 1790 and 1800 and is known as "The Old Plantation." Abby Aldrich Rockefeller Folk Art Museum, Williamsburg, Virginia. And is this difference of no importance? Is it not the foundation of a greater or less share of beauty in the two races? Are not the fine mixtures of red and white, the expressions of every passion by greater or less suffusions of colour in the one, preferable to that eternal monotony, which reigns in the countenances, that immoveable veil of black which covers all the emotions of the other race? Add to these, flowing hair, a more elegant symmetry of form, their own judgment in favour of the whites, declared by their preference of them, as uniformly as is the preference of the Oranootan for the black women over those of his own species. The circumstance of superior beauty, is thought worthy attention in the propagation of our horses, dogs, and other domestic animals; why not in that of man? The underlying tone of the narrative section of Jefferson’s Notes is confrontational. In it, Jefferson submitted questions designed to embarrass and expose the great Buffon for his pseudo-science. Who, Jefferson wanted to know, were the European travelers who had supplied the naturalist with his information? Where was the data about the animals they encountered? Could it be examined? Shortly after the publication of Notes, Jefferson was named United States minister to France. Though Jefferson generally avoided personal confrontations, he courted one with Buffon, calling upon him to present him with the hide of an exceptionally large American panther. Jefferson repeated many of his questions to Buffon in person, finally telling him that the American moose was so large that a European reindeer could walk under its belly. Buffon called Jefferson’s challenge, telling the upstart Virginian that if he could produce moose antlers that corroborated his story, he would retract his statements about the degeneracy of New World animals. Jefferson swung into action, bombarding his contacts back in the States with requests for moose and other American animals that would essentially bludgeon the smirk off Buffon’s face for good. 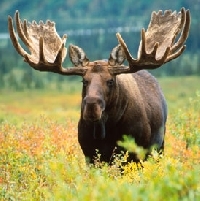 Governor John Sullivan of New Hampshire was deputized to get the moose, but unfortunately bungled the job and ended up sending Jefferson a hodgepodge of several animals. However, Jefferson apparently wore Buffon down with his dogged pursuit of the truth. Reportedly, Buffon promised Jefferson to set the record straight on New World animals, but he died in 1788 before he had the chance to write further on the subject. Well done, I recently stumbled upon this guy in something I read. (might have been Liberty’s Exiles … hmm) Now I’m going to have to go revisit. Your article provides nice color on an otherwise isolated anecdote.